“Will no-one rid us of this troublesome pest?” to paraphrase Henry II. He said that way back in 1170, coincidentally as football was establishing itself as a popular sport. Of course Henry was referring to the troublesome priest Thomas Beckett, formerly the king’s Chancellor, who went rogue after being appointed Archbishop of Canterbury, acting in defiance of Henry and the rest of the English bishops. He famously met an untimely end at the hands of four knights of the realm. Blackpool Supporters’ Trust is not for a minute advocating violence against the person of Owen Oyston. It would not be fitting for a legally constituted and peace-abiding organisation to do so. However, we could certainly do with a modern-day equivalent of those four knights of the realm to ride in and administer bloodless retribution in the current impasse at Blackpool. How about it FA, EFL, EPL and FIFA? The reasons why Owen Oyston should be regarded as a bad or ‘rogue’ owner of a football club are legion: the broken promises and the asset stripping have been bad enough. The suing of fans has also been unconscionable on every level. Contrast his behaviour with the principled and energetic leadership offered by – for example – Andy Holt at Accrington Stanley. There is, however, a more fundamental objection to the Oystons. Any chairman in League One worth their salt is desperate to take their club into the Championship for financial as well as footballing reasons. But getting there and staying there are two different things. We only have to look at our near neighbours at Deepdale to see how hard a division it can be. North End have had some good times in recent years, have even harboured hopes of Premier League football, but for the first time in several seasons their start to the campaign suggests that this year they are finding the job of being competitive harder work. It has already been made clear by the CEO of the Premier League that Blackpool will not be allowed back into the top tier while the current owner retains his controlling interest in the club. So as long as Oyston stays, our dreams of advancement are strictly finite. When you then have real reservations about his ability or willingness to even make it to the second tier, you have to ask yourself what is the point of Owen Oyston? 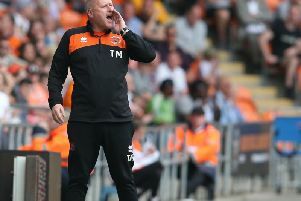 Even with the alleged attendances at Bloomfield Road, can anyone see him making us competitive in the Championship, even if by some miracle we manage to make it back there? The attitude of our owners toward the statues of Stan Mortensen and Jimmy Armfield speaks volumes about their priorities. The vandalism of the Morty statue prior to Judgement Day 1 caused understandable outrage, and although it has since been restored to some degree, Stan’s niece has again had to complain to the club in recent weeks regarding its condition and lack of maintenance. Even more alarming is the state of the area around Jimmy Armfield’s statue. A number of Blackpool fans have been highlighting the need for work to be carried out to the cracked and damaged paving stones. The situation deteriorated significantly a couple of weeks ago, when vandals pulled up some of the damaged blocks, making the whole area dangerous and unsightly. While the club did have some of the stones taken up and removed, nothing else has been done since. Today would have been Jimmy Armfield’s 83rd birthday and BST will be laying some flowers at his statue. It is very sad the club’s owners have been unable to provide more fitting surroundings for this great servant of Blackpool FC.